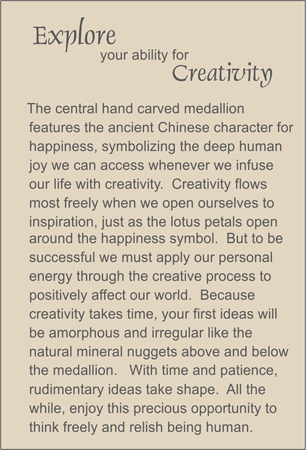 The taupe-colored serpentine medallion was hand carved with the open lotus flower surrounding the happiness symbol to represent creativity. Smooth Chinese turquoise tumbled nuggets are flanked by smooth smoky quartz ellipses and sterling silver snake cylinders. Sterling silver toggle clasp.